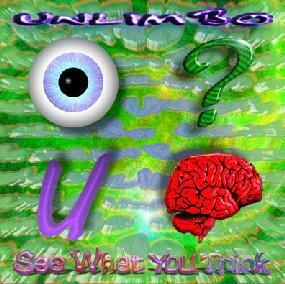 Unlimbo - "See What You Think"
Unlimbo are a band from Wales in the British Isles, and their sound is a mixture of the Ozric Tenticles, RDF and Culture Shock to name but a few. They produce free festival vibe music that is a must for fans of the fore mentioned bands. See What You Think has a very spacey ethnic vibe to it, very dub orientated in places, but all the while it is predominantly space music. It is an eight-track disc full of well played and well produced material. The opening track, 'Glassair', begins in a very spacey mould packed with nice Synth orientated stuff. It opens slowly to unfold an Ozric Tenticles styled piece, mostly Drum & Bass with layered Keyboards as with the Ozrics. It is not a million miles away from fellow stoners Krom Lek once it gets into the dub type ska part of the track the part where Music is the Creator. So I'm told. This space ska vibe carries into the tracks 'Woodhenge', 'Douk Chat', 'Amber' and 'Atree', all having a similar flavour to them. There is some nice Synth stuff here sequencer-wise as well. All tracks are very atmospheric and they explore the vast something's of somewhere. As with 'Inner Path' and 'Boin Go Theory', these tracks could possibly be likened to mellow Eat Static, sort of 'Area 51' style from the album Implant. 'My Friend Ali' was the track I had been waiting for because I knew inwardly that a Didgeridoo would appear somewhere on this CD, and it did on this sort of Gong-like track that has some enjoyable Vocals. I like it. All in all Unlimbo produce good Ethnic Space Dub vibe music that carries a variety of driving rhythms that are bound to get feet tapping. I think that See What You Think is a great album done very well indeed. It is also good to see that they are from close to home, just when I thought that nobody was into it anymore. For more information you can visit the Unlimbo web site at: http://members.sniffout.net/unlimbo/.